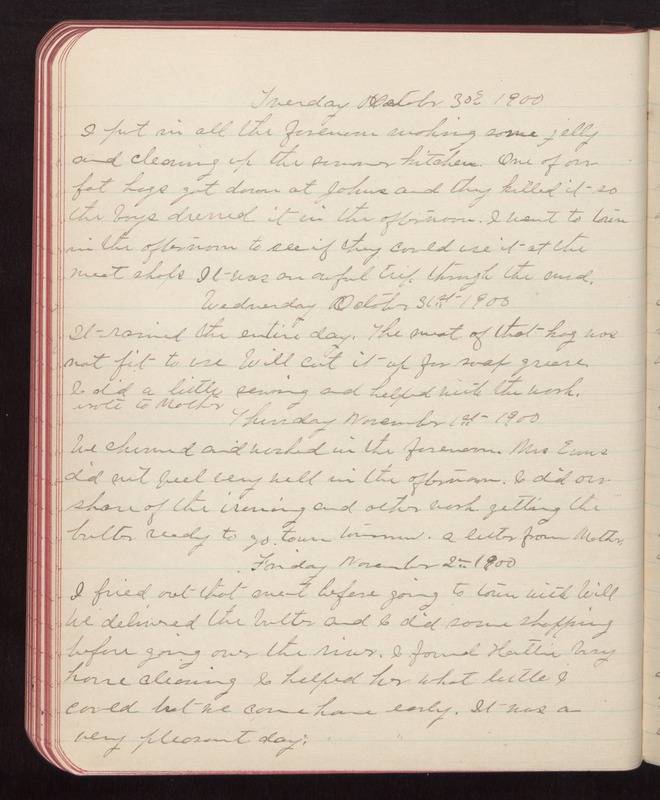 Tuesday October 30th 1900 I put in all the forenoon making some jelly and cleaning up the summer kitchen. One of our fat hogs got down at Johns and they killed it so the boys dressed it in the afternoon. I went to town in the afternoon to see if they could use it at the meat shops It was an awful trip through the mud. Wednesday October 31st 1900 It rained the entire day. The meat of that hog was not fit to use Will cut it up for soap grease. I did a little sewing and helped with the work. wrote to Mother Thursday November 1st 1900 We churned and washed in the forenoon. Mrs Evans did not feel very well in the afternoon. I did our share of the ironing and other work. getting the butter ready to go town tomorrow. A letter from Mother. Friday November 2nd 1900 I fried out that meat before going to town with Will We delivered the butter and I did some shopping before going over the river. I found Hattie busy house cleaning I helped her what little I could but we came home early. It was a very pleasant day.